This last weekend America’s National Public Radio (NPR) – the nearest the US has to the BBC or RTE – broadcast a follow up to the Chronicle of Higher Education’s devastating examination of Boston College’s handling of the Belfast Project, the oral history archive which sought to collect the life stories of former Republican and Loyalist paramilitaries, but which has been the subject, since May 2011, of subpoenas from the Police Service of Northern Ireland (PSNI) which allegedly is investigating the IRA’s disappearance of Jean McConville. NPR’s ‘On The Media’ programme, which regularly deals with issues affecting the American media, used two interviews by Brooke Gladstone, one with Anthony McIntyre, the former IRA prisoner and Belfast Project researcher and the other with Jack Dunn, Boston College’s public relations person to ask what the future of Oral History was in the wake of the subpoenas. 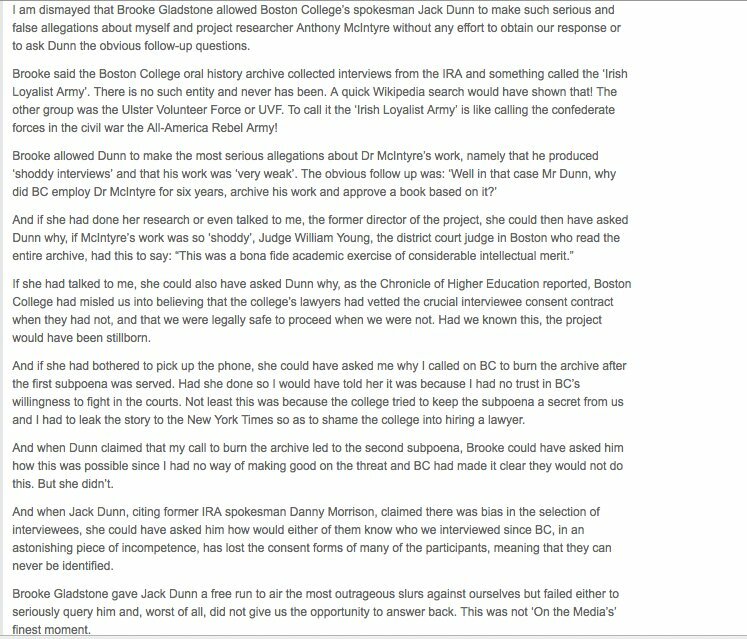 As the more avid followers of the story will know, ourselves and Boston College have been at daggers drawn in both our radically differing accounts of what happened when the project was set up and over our stinging criticism of the college’s cowardly approach to resisting the subpoenas both inside and outside the courts in the US. Invariably this dispute has set ourselves and Dunn at each other’s throats. That happened again on the NPR programme and in a colourful way, but this time Dunn showed a disregard for the truth that was staggering even by his tacky standards. 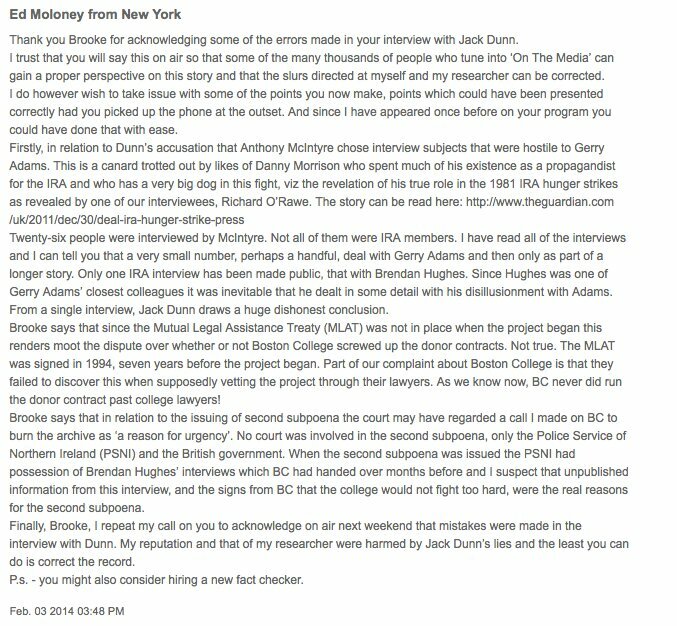 So outraged was I by the lies he told about McIntyre and myself that I lodged a complaint with NPR’s ombudsman, sent a message to the interviewer, Brooke Gladstone and posted this comment on ‘On The Media’s website which summarised all but one of the gripes I had with her interview with Dunn. 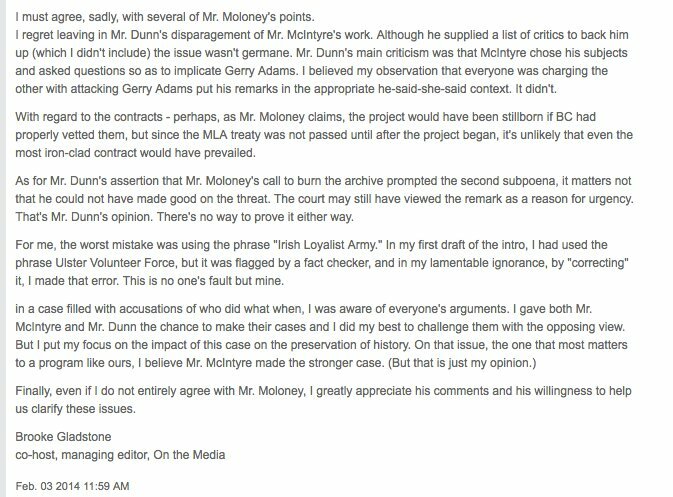 That dealt with what Dunn called McIntyre’s ‘lengthy history of criminal activity’, i.e. his life sentence for the murder of a UVF member in South Belfast. Because of space limitations imposed by the website I was not able to make two points in answer. One was that the US courts have recognised that IRA violence is fundamentally political in nature and to call it criminal is legally inaccurate in this country. And as a friend pointed out, ‘On The Media’ would not dare call a Palestinian fighter a ‘criminal’. The second point was that it was because of his IRA associations – not despite them – that McIntyre was hired in the first place. The project was constructed on the idea that former paramilitary activists would not speak frankly to academic oral historians but they might to people from their own community and background. That applied to both IRA and UVF interviewees. Boston College enthusiastically embraced that approach and Jack Dunn would have been very aware of it. For him now to use McIntyre’s background against him is despicable hypocrisy. A sorry tale of sloppy work. No wonder people have no faith in the media. Sadly many merely want to fill up their quota of words and get another glass of wine. Years back I was told that the NY Times correspondent on things Irish reported from London basing his accounts on those from the BBC. One night in the north of Ireland I was witness to a series of events and next morning read a supposed account of them in one of the local papers. It was the total opposite of what had occurred. Coincidentally I bumped into the author of the story a few days later and called him to account pointing out to him that I was at the site of the events ,that I saw no members of the media present and that the story had it all backwards. He admitted that he was not there at the time, it being too dangerous, and that the printed account which he authored was based solely on a press release from the RUC. This, he said, was his and most other journalists method of reporting in the north of Ireland.